I think my husband is convinced I've lost my mind. Okay, maybe he's thought that for a very long time, but that is completely beside the point. During my week off for Thanksgiving, I rattled on about making projects for Christmas. And what did I come up with, you might ask? Americana themed flags of course. Go 4th of July and Flag Day! So this year instead of Christmas in July, my family and friends will celebrate July at Christmas. I had made two wall hangings similar to these several years ago. The big difference was the blue square on the flag. 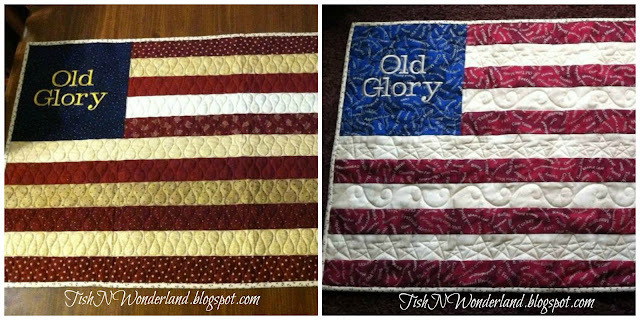 They were purchased at a LQS and had the words "Old Glory" embroidered on them. For my version, I replaced the "Old Glory" square with different 10" pieced stars, for a stars and stripes theme. In case you are looking for a super quick patriotic project, I thought I would write up a quick tutorial on how to put these together. You will need a total of 6 red 2 1/2" x WOF strips and 5 white/cream 2 1/2" x WOF strips. 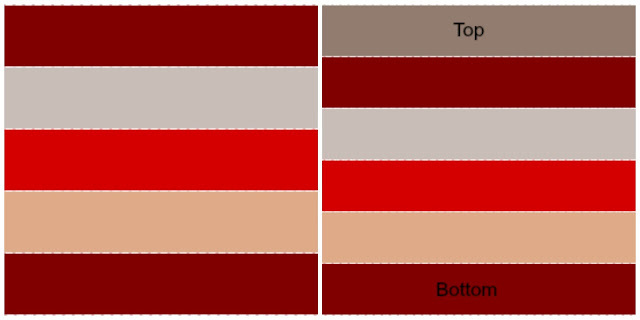 Sew your strips together, so that you have one strip set that is Cream-Red-Cream (C-R-C), two strip sets that are Red-Cream-Red (R-C-R), and one that is Cream-Red (C-R). Next, attach the C-R set to one of the R-C-R sets and a C-R-C set to the other R-C-R set. The strip set on the left (5 strips) will be the top half of the quilt and the strip set on the right (6 strips) will be the bottom. I have marked the top and bottom of the 6 strip set as orientation of this strip set is important. Now we are ready to trim the left hand side of our strip sets. I always try to make sure that my seams match up on the ruler to get the straightest cut possible. Now that they are trimmed, we are ready to start making the 10" star. I went a little over board and made a total of six flags as gifts. Below are the instructions for making the 3 different stars that I used. Pick your favorite and sew away. For all of my stars I used the following methods to construct the half square triangles and flying geese. 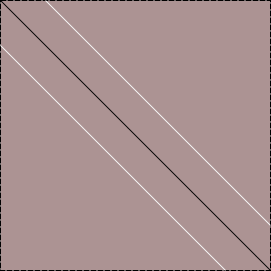 Start by drawing a diagonal line on the back of one square. 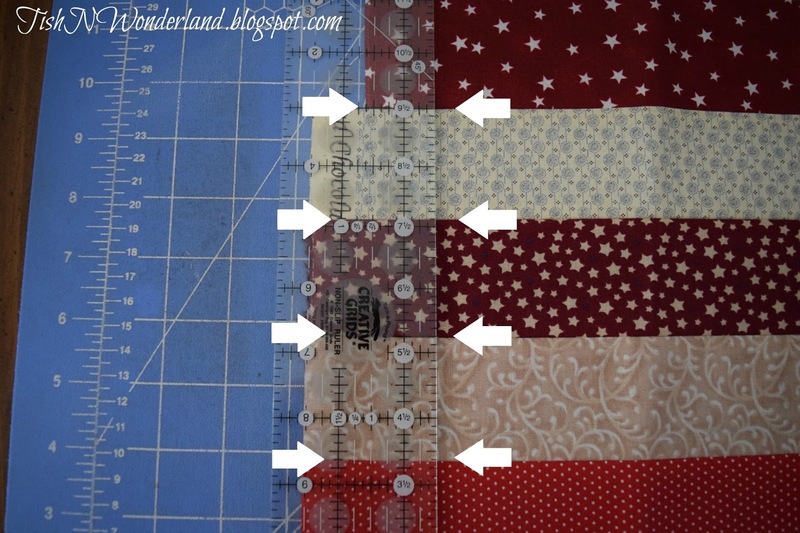 Place the squares right sides together, and sew a 1/4" away on both sides of the diagonal line. 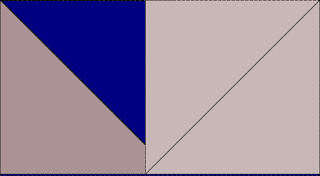 Next, cut on the diagonal line, press the seams towards the darker color and trim to the desired size. 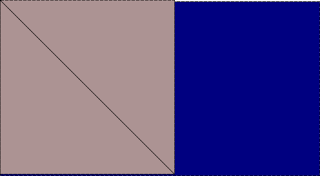 You will need a rectangle and two squares in the specified sizes. Draw diagonal lines on the backsides of both squares. Next place one square on top of the rectangle, right sides together and sew on the diagonal line. I like to trim the square about a 1/4" from the sewed diagonal line but not the rectangle underneath. That way when I press the wing of my goose, the size is more accurate. 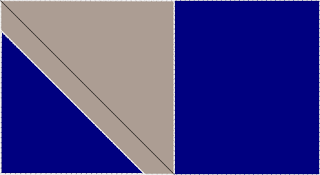 Next, place the other square on the opposite side and sew along the diagonal line. Once you have trimmed and pressed, you will have a completed unit. Fabric: 1 blue fat eight and 4 cream fat eighths. Using the 3 1/2" squares, place the cream 1 and cream 4 together and the cream 2 and cream 3 to make HST. Trim the units to 3." Then using the 3" squares use cream 1 and cream 2 to make two flying geese and cream 3 and cream 4 two units like the picture below. Arrange the units like the diagram below and sew the rows together. Fabric: You will need 1 blue fat eighth and 2 different cream fat eighths. 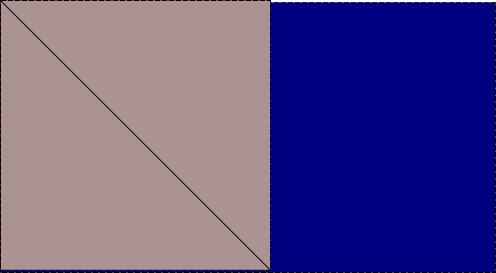 Combine the four blue rectangles and eight Cream#1 3" squares to make 4 flying geese units and the four Cream#1 rectangles and eight Cream#2 1 3/4" squares to make 4 flying geese units. 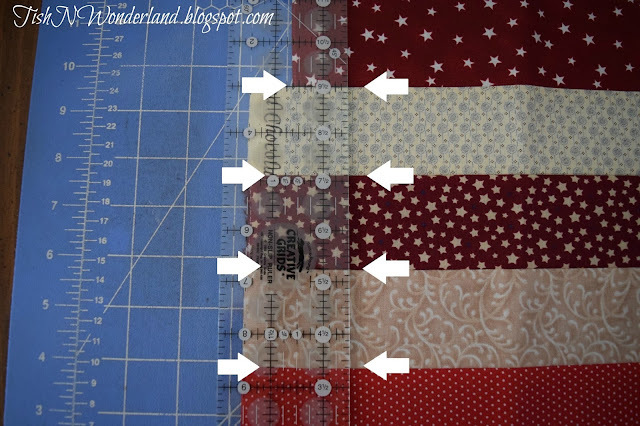 Arrange the units like the diagram below and sew together. Fabric: You will need 2 blues fat eighths and 4 cream fat eighths. 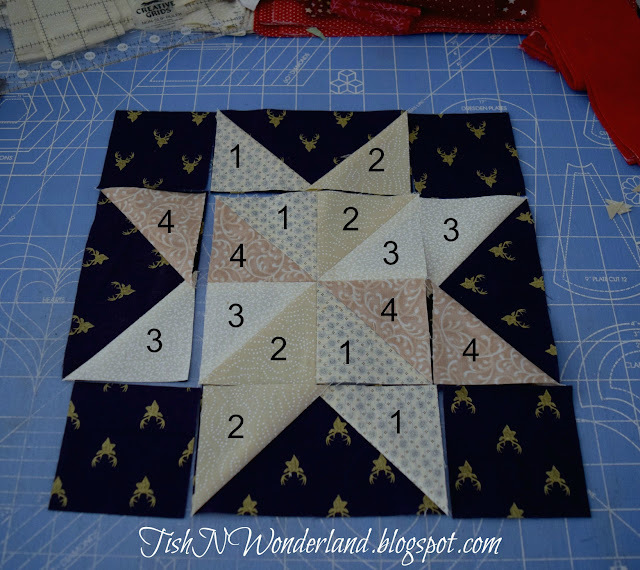 Combine 4 Blue 1 rectangles with the 8 Cream 1 1 3/4" squares to make 4 flying geese units. Then use 4 Blue 1 1 3/4" squares and the Cream 1 3" square to construct the small star below. Repeat steps so that you have a Blue 1/Cream 1, Blue 1/Cream 2, Blue 2/Cream 3 and Blue 2/Cream 4 stars like the picture below. Now you are ready to sew your blocks together to form your Rising Star block. 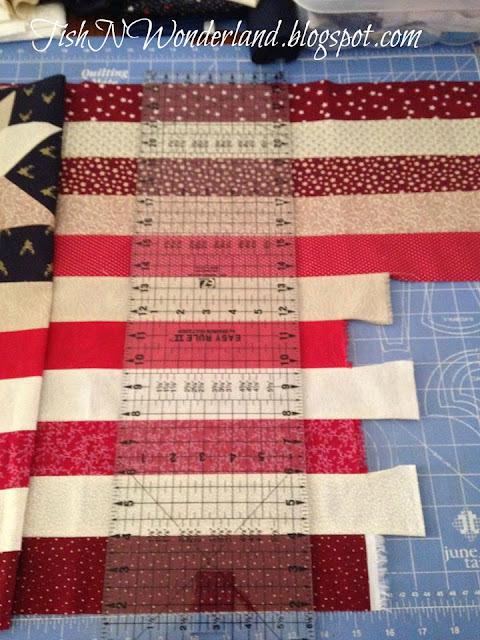 After you have 10 1/2" unfinished block pieced we can attach it to the top (5 strip set). Then attach the bottom to your top and trim the right side of the quilt. Honestly, I usually just eyeball the length, but it is around 40." 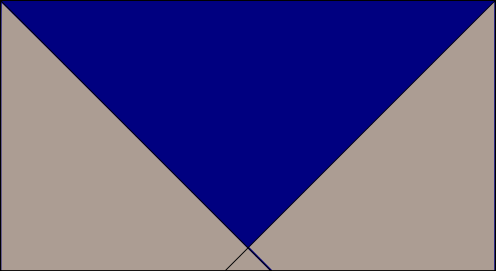 And there you have it, an Americana themed flag. Will I get my six completed before Christmas? I have high hopes. I have also provided a PDF version that you can download here. As always, if you make an Americana Flag of your own, I would love to see it! So this Christmas, light a sparkler and enjoy a big ol' cup of hot chocolate and marshmallows. 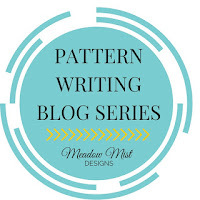 And a big thank you to Cheryl over at Meadow Mist Designs for taking the time to review my pattern for me. 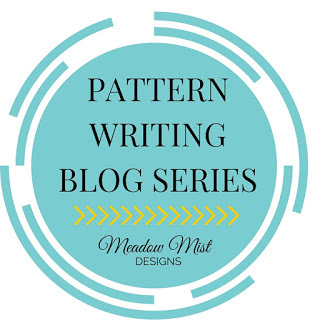 If you haven't heard already, Cheryl will be hosting a pattern writing blog series starting in January. I know I'm looking forward to it and hope you check it out as well. Spools of some of my favorite Aurifil colors are pulled. Quilting shall commence this weekend. Stay tuned for some quilty goodness. Come join the party! Today I'm linking up with Tuesday Archives, Let's Bee Social, Tuesday Archives, Too Cute Tuesday, Sew Cute Tuesday, Fabric Tuesday, Freemotion by the River, Main Crush Monday, TGIFF, Creative Goodness, Richard and Tanya Quilts, and Can I Get a Whoop! Whoop! What a lot of work this tutorial! Easy to follow to make such a beautiful wall hangings. Thanks for sharing. Al love all versions. Your tutorial was wonderful, thank you for allowing me to review it. These flag designs are beautiful! I like them with the stars much better than those embroidered panels. Quite clever, Tish! Thanks so much for sharing the tutorial! These are great! I agree with Lorna: the stars are butter than the panels. Congrats on the pattern. "write up a little tutorial" um this is an amazing amount of work you did here Tish! Thanks for it, and thanks for the PDF. Think there is one of these (not 6, lol) in my quilty future: my eldest was born on July 4, in Windsor, Ontario, Canada, within view of the lovely Detroit skyline and had that night had Freedom Festival fireworks for her birth...anyhow we've always had quite the affinity for all things Detroit and Michigan! Looks like a lot of your Christmas shopping is done, man! Great work on the pattern, Tish! Thanks for sharing it! Well done! Thanks for the awesome tutorial! I love this... celebrating July at Christmas! Bring on the warm thoughts. Your flags are beautiful. How funny...July at Christmas!! Your tutorial is amazing! Well done, it isn't easy writing them! Husbands always think we are crazy! It keeps the on there toes! LOL, July in Christmas is a reverse of what we usually hear, but who would not be thrilled to receive one of your beautiful flags? 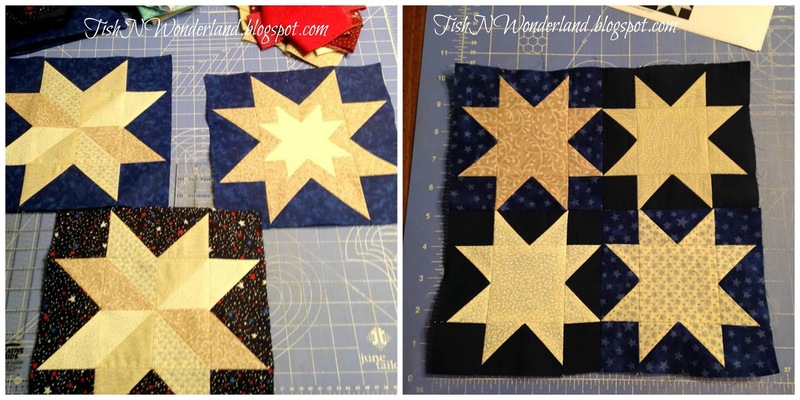 I love the star blocks and the elongated shape! Just wonderful Tish! Thank you for writing this tutorial! You did a wonderful job on the tutorial and the flags look great. 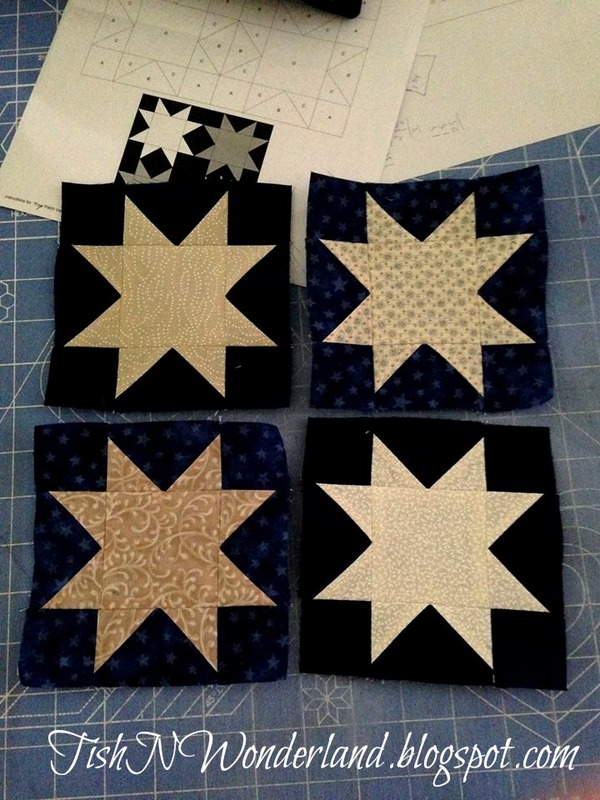 I think the pieced stars are much better than the panels. Quilt away, and have fun! Long may she wave! Great tuts and beautiful flags. Love them! That first photo is really amazing Tish, these quilts are wonderful. Thank you for sharing the tutorial!